Lan Su Chinese Garden, formerly the Portland Classical Chinese Garden and titled the Garden of Awakening Orchids, is a walled Chinese garden enclosing a full city block, roughly 40,000 square feet (4,000 m2) in the Chinatown area of the Old Town Chinatown neighborhood of Portland, Oregon, USA. The garden is influenced by many of the famous classical gardens in Suzhou. 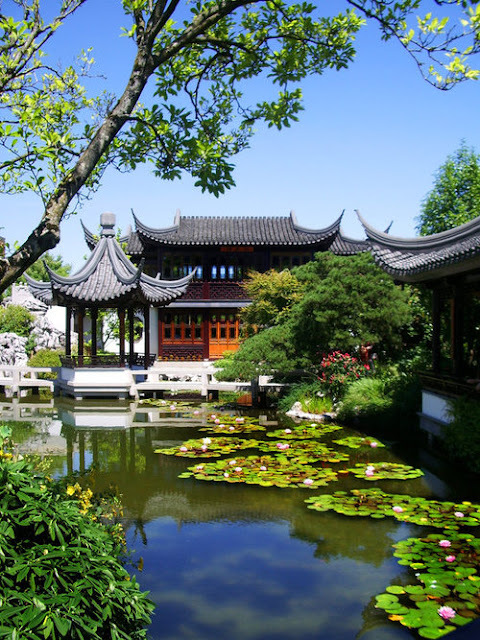 In the early 1980s an effort was started to build a Chinese garden in Portland, and in 1988 Suzhou and Portland became sister cities. Portland mayor Vera Katz continued those efforts in the 1990s and assisted in the non-profit group that operates the garden in finding a site for a garden. The garden was designed by Kuang Zhen Yan and built by 65 artisans from Suzhou on land donated by NW Natural on a 99-year lease; groundbreaking occurred in July 1999, and construction was completed 14 months later at a cost of about $12.8 million. 500 tons of rock, including Chinese scholar's rocks from Lake Tai, were brought from China and used in the garden. The garden's grand opening was on September 14, 2000. The construction of the central lake has created problems at times, such as leakage and one case of three visitors fallen into it.